UN Volunteers provide vital health support to the UN Mission in Somalia (UNSOM) and to many of its partners active on the ground. They provide the critical human resources necessary for the Mission to maintain healthy operations in the country, and despite all hurdles, these UN Volunteers deliver ongoing medical services and training that sustain the health of partners and UN personnel and reinforce their ability to carry on with the mandate of the UN in the country. UN Volunteers serving with the UN Mission in Somalia (UNSOM) have a unique set of challenges. The security situation is such that independent circulation is highly restricted, if not impossible. The volatile environment poses continuous security risks both to local populations and to UN personnel. Suicide bombings, kidnappings, assaults, and theft—all exasperated by the ongoing threat of famine and the desperation that is born from the economic crisis that plagues the country—impose on all UN personnel a strict code of conduct that greatly limits the potential for interactions with local populations. In Mogadishu, the day routinely begins with a survey of serving UN Volunteers to ensure their location and safety—sending messages, making phone calls, and communicating with various UN agency support staff. UN Volunteer Medical Doctors and Officers, part of the Medical Emergency Team (MERT), are essential to the operations of the UN Department for Safety and Security (UNDSS) in Somalia. The medical team supports the Mission by firstly assuring the health of its personnel, a critical element of UN operations in remote and isolated areas where little to no external support can be provided. In addition to the needs of UN agencies in the country, these UN Volunteers regularly offer training to medical and para-medical personnel outside of UN operations, sharing their expertise with the African Union Mission in Somalia (AMISOM), the Somali National Armed Forces (SNAF), and a variety of national partners involved in the Somali peace process. Ten international UN Volunteers currently serve in medical capacities for the Mission. UNV is a partner of choice when it comes to this mission because it is a valuable bridge between us as a mission and the Somali community. Some of the volunteers have worked in other missions with similar mandates and they come with a wealth of experience. For example, our UN Volunteer Medical Officers and Nurses offer direct medical attention to a number of our staff and their dependents.” —Mr. Amadu Kamara, Director United Nations Support Office in Somalia (UNSOS). 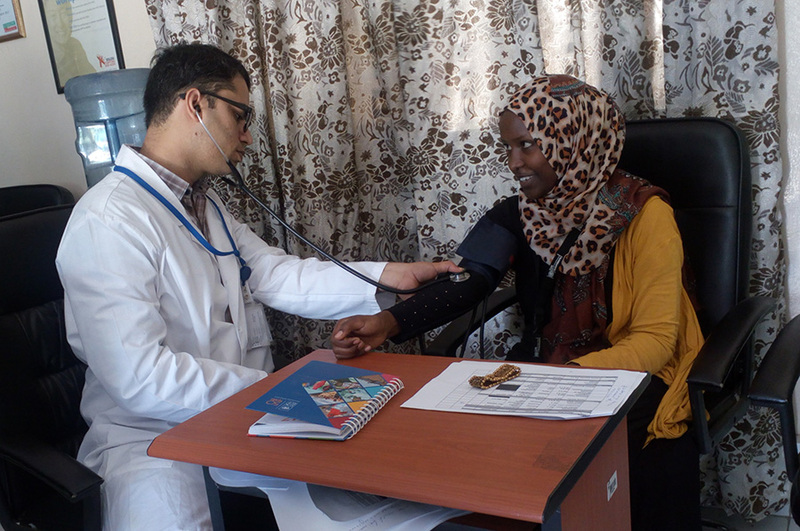 The trainings offered by theses UN Volunteers support the development of medical capabilities in Somalia. They cover everything including basic life support (BLS), advanced cardiac life support (ACLS), pre-hospital trauma life support (PHTLS), public health education, and HIV/AIDS prevention. Furthermore, UN Volunteer Medical Officers participate in advanced preparation and implementation of mass casualty incidence (MCI) response, medical evacuation (MEDEVAC), and evacuation of casualties (CASEVAC), assuring through their training sessions that standard operating procedures are observed by all. Limited interaction between UN Volunteers and local communities have proven to be a major obstacle to their volunteer service beyond the duties of their assignments, limiting opportunities for engagement with vulnerable groups. Despite their desire to be more involved with local communities, security concerns simply prohibit their free movement outside of the UN compound—an obstacle even harder to accept for those who are obliged to serve remotely from Nairobi, Kenya. Obtaining the requisite security clearances needed to travel is difficult even under the best circumstances. Perhaps one day soon, peace will return to Somalia and this situation will change.